Ice cream is very much welcomed as a sweet treat on a hot day or the perfect dessert option. And then there is another variant known as Gelato and while both may seem the same at one glance, slight differences set them apart. A counter top is more suitable for shops that sell a low volume of the product whilst the floor model works for high yielding operations. 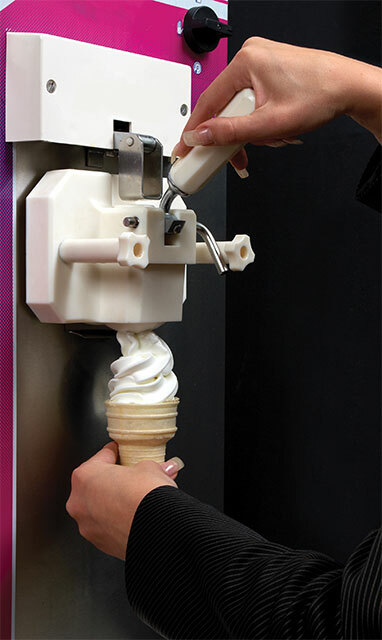 You can serve more than one flavour or even choose a machine that dispenses ice cream featuring two flavours intertwined. High volume production would usually use the pressure-fed function as it produces more yields from the amount of air whipped into the mix and uses a pump to transfer the mix from hopper to the freezing cylinder. Comparatively, a gravity function is less expensive, uses gravity to transfer soft serve mix through feed tubes into the freezing cylinder and makes less ice cream. In a limited working space, an air-cooled machine would be more viable as it does not require a water hook-up to cool the ice cream but the machine should ideally be placed in a room with air conditioning. On the other hand, a water-cooled machine is able to store more energy to cool ice cream faster and can be placed in a warm room yet perform with the water hook-up. It would be wise to look for one that has a low mix alarm as it alerts the operator when the mix level is too low in the machine; important as the remaining ice cream will freeze up and possibly damage the blades on the dasher. 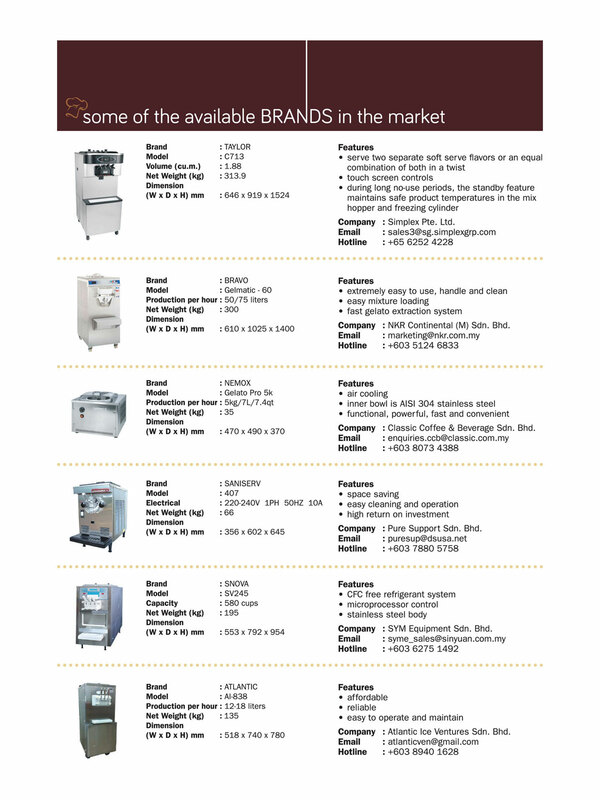 This is suitable for gelato businesses as the product does not have to be stored at extremely cold temperature compared to ice cream so you can have gelato in quick time. With a built-in freezer unit, there is no need for pre-freezing basins and gelato is made by turning on the unit for a few minutes to cool and adding the mix with the paddle starting the mixing while the dessert freezes. In 20-30 minutes, you have gelato. This type is a pretty heavy investment but is found to be most convenient and the factor might cancel out its size and noisy operations. It is not recommended to use an ice cream machine to make gelato as the composition between both items are different and require different methods.